Toshiba’s Portege Z830 Ultrabook, a device the company is billing as the world’s lightest 13-inch laptop, is now available online at Toshiba.com for consumers to buy. Four models of the Ultrabook, starting at $929, are now available, or shoppers can build their own starting at $1,099. The configurable model and the two higher-end Z830 models, priced at $1,199 and $1,429, are considerably more expensive than competing Ultrabooks like the $899 Acer Aspire S3. 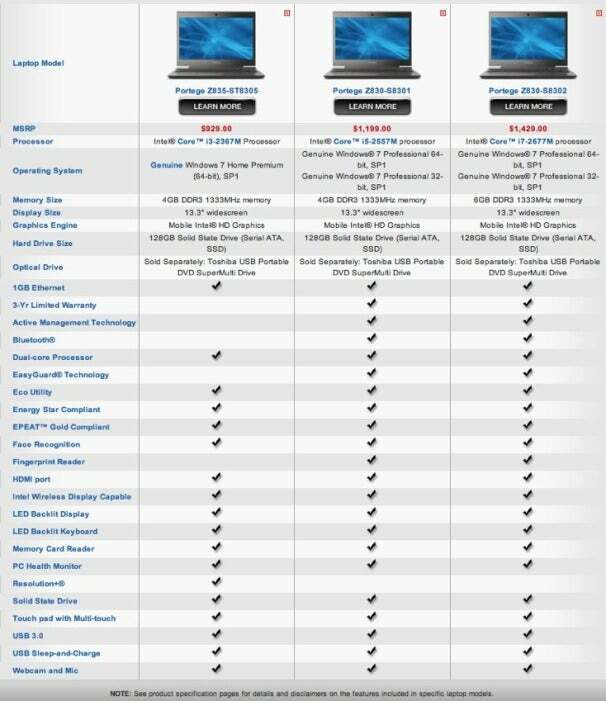 But the extra price gets you a bunch of upgrades, including: an Intel Core i5 or Core i7 processor, Windows 7 Professional, a three-year warranty, Bluetooth, a fingerprint reader, and, in the case of the $1,429 Portege Z830-S8302, 6GB of memory instead of 4GB. Still, Acer offers a pumped-up model of the Aspire S3 with Intel Core i7 processor and 256GB SSD for $1,299, making Toshiba’s higher-end Ultrabook seem less of a great value. Still, you can pick up less expensive editions of the Toshiba Portege Z830, dubbed the Z835, and if you’re looking for the lightest Ultrabook available now, this is your laptop. PCWorld laptop editor Jason Cross, in his review of the Portege Z835, said the weight difference between Toshiba’s Ultrabook and other Ultrabooks and the MacBook Air is immediately noticeable. The Portege weighs 2.4 pounds; the 13-inch Air weighs 2.96 pounds. An exclusive Best Buy Z835 model is priced at $799. Comparing Toshiba’s $929 Z835-ST8305 and $929.99 Z935-P330 models (the latter adds a fingerprint reader) against the Best Buy version specs, I couldn’t find any significant difference, so you might as well pick up the laptop from Best Buy. All offer the same 1366- by-768 resolution on the 13.3-inch display, an Intel Core i3-2367M processor, 4GB or memory, and a 128GB solid state drive. The Z835 has other things going for it besides light weight, as Cross noted, such as a full array of full-sized ports, a backlit keyboard, and a solid state drive. If you’d like to order yours now in time for unwrapping for the holidays, head to Toshiba’s Portege Z830 page; Toshiba says the laptops will ship in about three to four weeks.